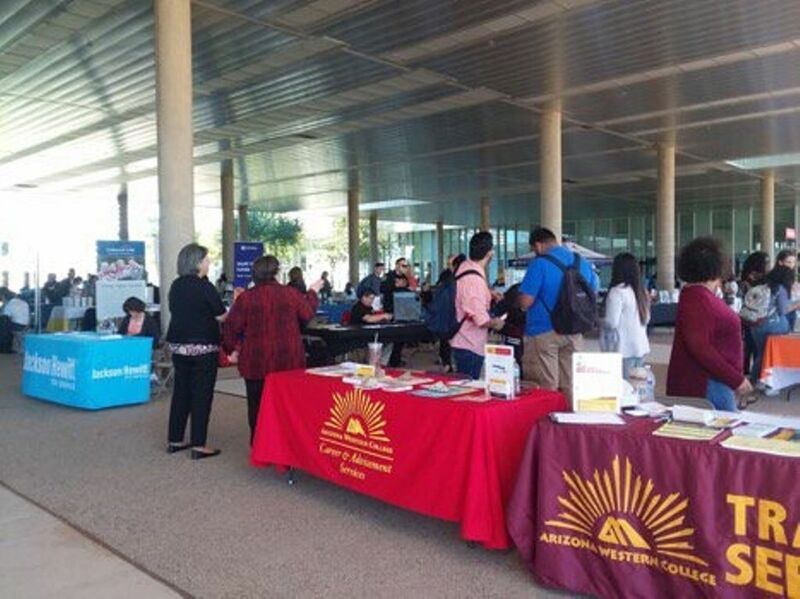 Two or three times each semester, representatives from various schools and organizations gather to provide information to students interested in pursuing their education beyond Arizona Western College. The Arizona state universities – NAU, ASU and UofA – as well as other colleges set up tables with trinkets such as pens, journals, Frisbees to hand out to students as a sort of reward for taking the initiative and the next step. At the most recent Transfer Fair, AWC Transfer Services offered incentives to students in the form of a raffle drawing for a $500 scholarship. The eligibility criteria consisted of students filling out a “transfer passport,” having a cumulative GPA of at least 2.0 and having been accepted to a university, along with submitting their resume, application and an essay. The transfer passport was given to students after they signed in at the Transfer Services table, and they had to go to at least four different tables for information and get a stamp. In addition to the universities, organizations such as Border Patrol and the armed forces provided information for those students interested in pursuing a career after AWC. Claire, like many students at the event, was eagerly seeking information about possible universities to attend as well as a career to pursue. Transfer Services promote opportunities for students pursuing higher education, by presenting them with their various options. “We look at what is transferrable from here to other places,” said Daniel J. Fitts, a transfer specialist. The Transfer services also deal with students coming into AWC, not just locally but also from other places, including foreign countries. Students with interest in transferring to other cities and universities after graduating AWC can seek help and information at the Transfer Services center located at the top floor of the 3C building. Students can also email transfer.services@azwestern.edu or call 928-344-7638 and speak to either Fitts or to the other specialist, Angela Amezaga, whose direct line is 928-344-7630.